I've struggled with my sleeping routine for a fair few years now. I can go for weeks experiencing nights of blissful sleep only to find myself staring at the ceiling at 2am, unable to switch off a day later. For me this is part and parcel of living with anxiety, but insomnia is something that can affect anyone, and in varying degrees. Altering your daily habits may be all that is needed. Limit your caffeine intake, avoid daytime naps and ensure your bedroom is a tidy and comfortable space. Lately, I've dished out some of my top tips to friends and family who have been having trouble getting some much needed shut-eye. I decided to put this post together in the hope of helping others with their bedtime routine. I'm certainly no sleep expert and the following tips are methods that I've found to be personally successful. Turn off the laptop and resist your usual nigh time Instagram scroll. The blue light that digital screens emit trick your brain into thinking it's still daytime. This is bad news for your circadian rhythm and prolonged night-time use can wreak havoc on your sleep pattern. I like to take time getting ready for bed and make sure I have enough time to take off my make-up. The Body Shop's Chamomile Silky Cleansing Oil is my current favourite product for this. Not only does it remove everything in one swipe, but it's scent is incredibly calming too. A good night cream is an essential and I also add in Origins Drink Up Intensive mask once a week. This is also the time I pop on hand cream, leaving it to do its magic overnight. 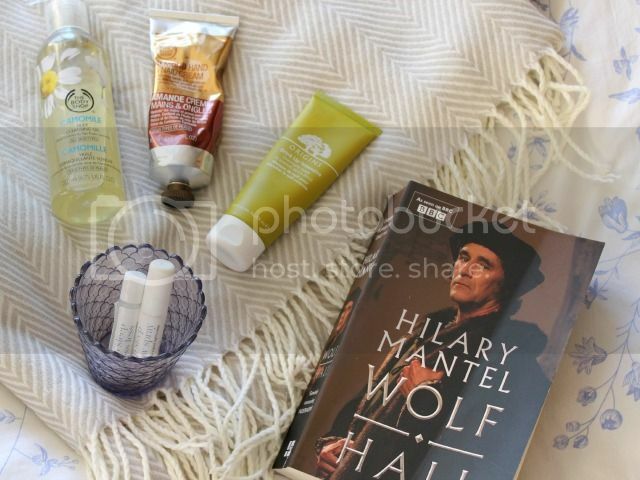 The Almond Hand and Nail cream from The Body Shop is what's currently in my bedside drawer. After using these lightly scented products every night and taking some time to look after myself, I feel pampered and content when I crawl under the duvet. Yoga is the newest addition to my bedtime routine. I've used both yoga and pilates before as relaxation techniques, but there's something especially soothing about being in child's pose on the bed with the lights down! I do a 5 to 10 minute routine of basic poses - take a look on Pinterest for some inspiration. The gentle stretches help to relieve any physical tension and clear your mind. For me this works wonders! If I'm feeling anxious at bedtime, I'll reach for This Works Dream Team Duo kit. The pair includes a pillow spray and roller-ball, both of which contain dreamy mixes of natural oils; including lavender, chamomile and patchouli. I use the roller-ball the most, applying it to my wrists as soon as I get into bed. Make sure that your reading material is bedtime appropriate. I'm not talking 50 Shades - just check you haven't cuddled up with something which engages you too much. I once stayed awake until 6am because I couldn't put down Rushdie's Midnight Children. Not ideal! At the moment, reading before bed really helps me to unwind. I read until I my eyes feel heavy before turning off the light and snuggling down. I love this post! I suffer so badly with sleeping and have for years, also my anxiety keeps me awake at times, but mostly insomnia. I'm definitely going to try yoga poses and break the habit of using my phone at early hours when I can't sleep! Bedtime tech ban is my top tip too.